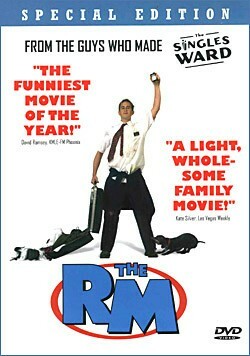 MormonInfo.org - Mormon Oriented Movies - The R.M. The R.M. is Mormon lingo for the "Returned Missionary." This is another LDS comedy from the creators of, and with many of the same actors from, The Singles Ward (Halestorm entertainment), so I was really looking forward to watching The R.M. Sadly, I thought The R.M. was a letdown compared to The Singles Ward. I just didn't think The R.M. was as funny. But in comparison to Halestorm's other work, The Home Teachers, The R.M. was much funnier and more enjoyable. As a cautionary note, much of the humor in these films is understood only by Utahans, and even a lot of the humor will go right over the heads of most LDS outside of Utah. A typical R.M. goes through a difficult transition period when he or she first arrives back home. "Difficult" is an understatement in this movie staring Kirby Heyborne as Elder Jared Phelps. Everything that can go wrong does go wrong. For Jared, this begins the moment he gets off the airplane and no one is there to welcome him back. He takes a bus back home only to find that his family has moved. He finally gets reunited with his family, and finds that they've sold his car to help his brother go on his mission. Jared's girl is now engaged to some other guy. He can't get a decent job. He gets rejected from BYU. And he even gets boils to boot! Throughout these physical trials, Jared remains faithful and God rewards him with a girl (Kelly Powers played by Britani Bateman) who takes an interest in him. But the biggest trial comes when he is put in a situation where he is tempted to take the easy road and lie in order to avoid jail time for himself as well as his lifelong friend, Kori (Will Swenson). Kori was drinking and driving the governor's car as a yearly fraternity prank, and Kori happens to drive up to Jared as he was finishing his home teaching assignments. For Kori's protection, Jared drives him back home, but unfortunately gets pulled over by the cops. Kori's lawyer tells both Kori and Jared how they are to lie to get over. Jared can't bring himself to lie in court, and Kori surprisingly affirms Jared's testimony to keep him out of jail. As a result, Jared goes free, but Kori spends time behind bars. In addition to Jared being rewarded with freedom, he gets engaged to Kelly. Now there are a couple related theological points of interest to touch on. First, it was interesting to see Kelly's absence in Jared's life during the time that he was awaiting his court case. Only after Jared was cleared of all wrongdoing did Kelly show up. She waits for him to prove his (temple) "worthiness." But this isn't at all surprising when one notes how LDS learn this from their god. Without the push for "worthiness," LDS aren't assured of their standing with their Heavenly Father. This progress toward eternal life is a matter of achieving perfection. Living all the commandments guarantees total forgiveness of sins and assures one of exaltation through that perfection which comes by complying with the formula the Lord gave us. In his Sermon on the Mount he made the command to all men: 'Be ye therefore perfect, even as your Father which is in heaven is perfect.' (Matt. 5:48) Being perfect means to triumph over sin. This is a mandate from the Lord. He is just and wise and kind. He would never require anything from his children which was not for their benefit and which was not attainable. Perfection therefore is an achievable goal (208-9). Christians, on the other hand, have a way of attaining perfection that is not dependent on their law keeping (Romans 4:5, 11:6, and Ephesians 2:8-9). That perfection is simply in Christ Himself. He is our "propitiation" (1 John 2:2). "For he hath made him to be sin for us, who knew no sin; that we might be made the righteousness of God in him" (2 Corinthians 5:21). Through His one sacrifice, those who have been set apart for Christ "he hath perfected for ever" (Hebrews 10:14). Being justified by faith (repenting--turning from self to God), this is the peace they have with God; they are able to "have access by faith into this grace wherein [they] stand, and rejoice in hope of the glory of God" (Rom. 5:1-2). Christ comes into their lives through faith, and begins a work to make them like Himself; it's from the inside out (Galatians 2:20). And they can completely trust that "he which hath begun a good work in [them] will perform it until the day of Jesus Christ" (Philippians 1:6). Finally, for more reviews and information on The R.M., click here.